As is the protocol, the MLB reviewed the ejection of Bryce Harper from last Saturday’s Nationals versus Pirates game in the bottom of the first inning. Harper was called out on a check swing by third base ump John Hirschbeck. Harper then threw his hands in the air, Hirschbeck followed suit in an almost mocking fashion while walking towards Harper, and the two exchanged words. Harper then turned to return to the dugout and tossed his helmet. After tossing, not throwing, his helmet, Hirschbeck then threw him out of the game. The MLB reviewed the ejection and decided not rule at all and let things go. Niether Hirschbeck nor Harper received further disciplinary action, much to the dismay of many Nationals supporters, including myself. Hirschbeck should receive some sort of reprimand for his actions. He threw his hands in the air as if to mock Bryce Harpers reaction, then began to walk towards him in a challenging manner while the two exchanged words, and then muttered something under his breath after he ejected Harper from the game. If you look at the replay, it does appear as if the veteran umpire said something, I’m not sure what, after tossing Harper. But, I don’t think it was very nice. Personally, I feel that Hirschbeck went on a bit of a power trip and tried to show Bryce Harper who’s boss out there on the diamond. It was almost as if Hirschbeck wanted to make sure that the “young gun” didn’t get to big for his briches and tried to put the young player back in his place, wherever that may be. It would be interesting to see how Hirschbeck would react if a seasoned veteran ballplayer had had the same reaction. They always say that if you know the umpires name, then he’s done something wrong. 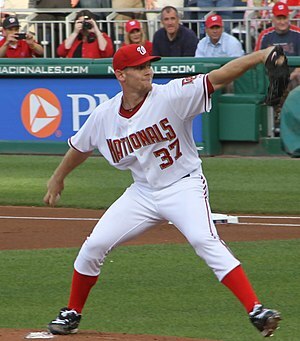 I don’t think very many Nationals fans will forget the name John Hirschbeck. Hopefully he doesn’t have a game at Nats Park on his schedule for the rest of the season. I don’t think Davey Johnson will be sending him a Christmas card, either.